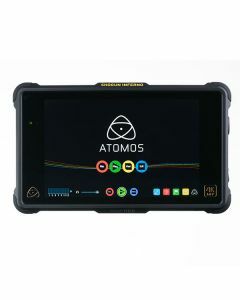 The industry leading 7” field monitor takes shape in the Atomos Flame Series. With 10-bit Colour processing, the AtomHDR engine processes 64 times more colour data than traditional 8-bit panels. The Atom Flame Series precisely displays 10 stops of the luminance detail of Log with 10 bit HDR Post Production colour accuracy. This is the first time this level of detail has been provided in a field monitor. The significantly improved power management shooting system enables the user to continue shooting for longer in the field - for Rec709 standard dynamic range scenes the 1500nits brightness further assists the act of outdoor recording. The professional 4K/HD ProRes/DNxHR Recording, Playback and Editing that has made Atomos notorious also comes fitted as standard, of course. The Atomos Shogun Inferno advances much of the Shogun Flame’s specifications. There are upgrades to HDR, video and audio in/outs and on board processing power. It ships with Master Caddy II x 1, 12V-3A AC power supply, Breakout XLR cable. Two main accessory bundles are available - Accessory kit and Power Kit.